A rack and pinion would be used if linear motion is required. 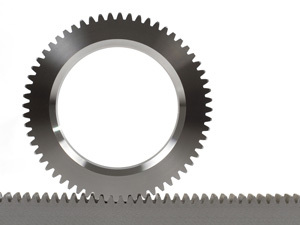 The pinion engages with the teeth on a linear gear or ‘rack’ and this rotational movement causes the rack to move. B&F can provide racks with a maximum face width of 2.5”/64mm and a maximum pitch of 4DP/6.4MOD. The length of the rack that B&F can cut would depend on a combination of face width and the overall cross section of the rack.